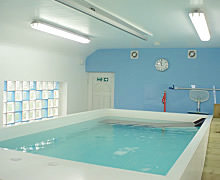 Unlike other facilities, we operate a combined Hydrotherapy facility, offering the leading edge techniques in treatment. Combining pool and spa activities results in the fastest and most thorough rehabilitation response. Our fully equipped custom built indoor pool measures 8 by 12 by 4½ feet deep and is heated to around 27 degrees centigrade. The pool is equipped with 2 anti-swim jets, which are adjustable for both flow rate and direction. Entry & exit is provided by gentle ramps and electrically powered hoist. Pool water hygiene is critical and we regularly and methodically test and record water results to ensure correct chemical and pH balance. Even though your pet may be a natural swimmer, we provide and fit flotation jackets to all patients. We work one to one with your pet and will always have a Hydrotherapist in the pool at all times with the animal. We encourage owners to participate in all aspects of the exercise session although owners are not allowed into the pool itself. We actively encourage you to bring your camera and take still or video pictures as a referance history for the progress of your pet. You can be involved in throwing toys and actively encouraging effort and focus - more effort in means better results out! You are the key partner in your dog's well being and your dog will appreciate your presence. The Jacuzzi Spa is the key to providing a balanced and complete therapy session. Physiological and psychological levels are quickly boosted and maintained for longer after the spa session offering only positive side-effects. The warmth and circulation of the aerated water relaxes the skin, fascial and superficial muscles. The buoyancy of the water relieves weight and stress on the joints of the limbs. Blood vessels dilate, heart rate and pressure drops and the dog relaxes, allowing for the speedy removal of lactic acid from the tissues, helping condition the muscles. The Jacuzzi Spa is also beneficial for paralysed, post-surgery or injured dogs that do not want to bear weight on a limb. Dogs with neurological disease also derive significant benefits through proprioceptive feedback stimulation.